A golf glove should feel snug, but not restrictive. A golf glove isn't a necessity, but it's an important accessory for most golfers. A glove prevents the club from slipping, especially if you have sweaty hands, and protects your hand from blisters. Look for golf glove functionality. The golf glove you choose should have padding in the palm. 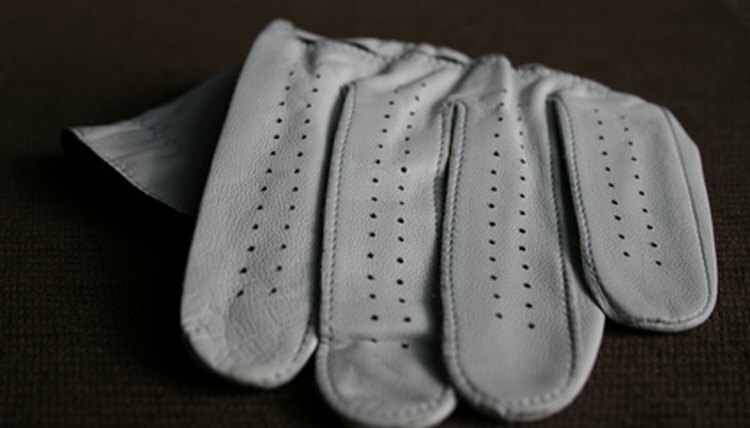 Better gloves have stretchy material at the knuckles, allow your glove to flex as you grip the club. Look for a glove that is comfortable. The glove should feel snug, almost like it is a second skin. However, you don't want it to be too tight because that would make swinging the club uncomfortable. Choose a material that feels right to you. A fine cabretta leather glove will have a soft feel that will mold to your hand, but better synthetic gloves can mimic the feel of leather. Look for a heavier glove if you are inclined to play a lot of golf in the cold weather months. Consider a set of winter golf gloves for those really cold days. Buy a set of rain gloves if foul weather doesn't keep you off the course. Both winter and rain gloves are worn on both hands. Look for a specialty glove if you suffer pain from arthritis. This type of glove provides a better grip and padding. Try on the glove even if you know your size. Gloves sizes vary from one manufacturer to another and sometimes among the same manufacturer's products, depending on how the glove is cut.